I’ve been writing articles for LDS Blogs for five years. Originally, I wrote weekly articles about marriage. Then I wrote weekly “Daily Dose” articles teaching gospel principles based on a quotation. 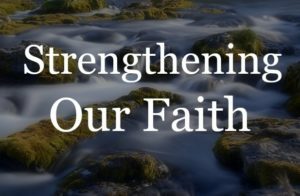 The last two and a half years, I’ve written bi-weekly articles under the category “Strengthening Our Faith.” As you can imagine, there are times when I struggle coming up with an idea for an article. Occasionally, I have reached out to family and friends on social media for help. I did so recently in a stupor of writer’s block and seeming lack of inspiration. I was not disappointed. As a matter of fact, I was given a lot of good suggestions for future articles. How do we strengthen our faith in the Savior? A friend saw my social media post and the comments. She and I are in a small private online group, so she brought it up in our little group. We had a very interesting discussion about how faith is actually strengthened. I came away from that discussion with new insight and a lot to think about. We all can list hundreds of life scenarios when we need to have faith. A writer could take each scenario and relate it to a personal story where faith was needed and how faith was mustered. As pointed out in the discussion, the Savior taught in parables, or stories. It was also pointed out that if we just read the story and don’t apply the principle behind the story, then it is pointless. While talking about this, someone said that when Jesus taught in parables, He expected that unbelievers would just see it as a good story, but that true disciples would look for the principle behind the story. In the end, our faith is strengthened only when we put our trust in the Savior. It is not enough to have faith that a particular problem will work itself out, or that “this too shall pass.” It isn’t enough to have faith that we will get through this particular trial, or that Heavenly Beings really exist. We must focus on Christ for everything—read His words, believe Him, trust in Him, count on Him, be dependent upon Him. One of the things that was made clear in talking about this is that I need to testify of Christ in each one of my articles. It is perfectly acceptable to share personal stories (parables) as long as 1) each story contains a principle that testifies of Christ, and 2) my readers look past the story to find that principle. Obviously, I only have control over number one. My readers have agency to concentrate on the story (what I refer to as fluff), or to apply the principle behind the story. To read more of Tudie’s articles, click here. I’d like to tell you a story today. It is a story of a time when I was struggling. I was working full-time, raising teenagers, and I had a very stressful church calling. My husband and I were at odds over one of the teenage issues. It seemed that everywhere I turned with my calling, as well as with the teenager, I hit a dead end. Having a self-reliant personality (my new term for stubborn), I was determined to solve every problem on my own. It was only when I was close to a nervous breakdown that I spent an evening pouring out my soul in prayer. 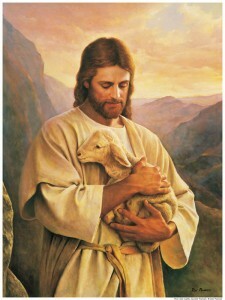 My problems were given to the Savior. I completely turned them over to Him. I let Him handle everything. This was not easy for Tudie, the control freak. Yet, once I turned it all over to Him, everything in my life seemed to fall in place. I was smart enough to realize that this was not a coincidence. So, what happened? My faith became stronger. As I exercised a particle of faith, my faith grew stronger. To be perfectly clear, my faith in the Savior was strengthened. In light of the online discussion with sisters who I have truly grown to love over the last several years, I want to take this opportunity to bear my testimony of Jesus Christ. He is ever present in my life. I have had my share of trials and heartaches. I’ve had sleepless nights. There has been physical pain and mental anguish. I’ve dealt with loss and grief. There has been stress, anxiety, and depression. I remember a time when it was hard to get out of bed in the morning. I just wanted to pull the quilt over my head, stay in bed, and not deal with the day ahead. There were sleepless nights when I looked out the window at the night sky and wondered if there was anyone out there—and if there was, why did I feel so alone? Yet, I was never alone—not for one minute. There was always a Guiding Hand. 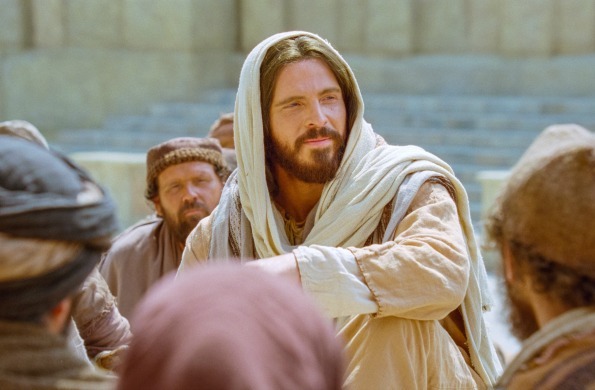 Looking back, I can see that I was guided by the Savior every inch of the way. He lives. He is the way, the truth, and the light. My faith is strengthened every time I listen to Him. Tudie Rose is a mother of four and grandmother of ten in Sacramento, California. You can find her on Twitter as @TudieRose. She blogs as Tudie Rose at http://potrackrose.wordpress.com. She has written articles for Familius. You will find a Tudie Rose essay in Lessons from My Parents, Michele Robbins, Familius 2013, at http://www.familius.com/lessons-from-my-parents#.UYPhA6K.